Liz is one of our string teachers. 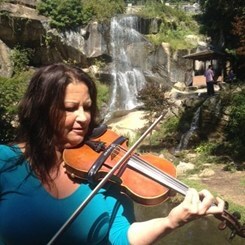 She teaches violin, viola, cello, and upright bass. She has a B.A. from Cincinnati Conservatory of Music. She has over 20 years of perfomance experience including playing at Colonial Williamsburg, the Aspen Music Festival with Isaac Stern and Itzack Pearlman, and as principal violinist with the European Goodwill Concert Tour. Liz has over 27 years of teaching experience, including teaching for Newport News City School.